Finding Greyhound locations for a night out at the dog tracks has never been easier with this guide to all the greyhound stadia in the UK. Greyhound racing is such fun for all the family and explains why this sport is growing in popularity. The sport in the UK has always had a small but enthusiastic band of followers and with 24 tracks around the country there is likely to be one nearby for most UK racegoers. The tracks are between 300m - 400m in circumference and the dogs chase a motorised hare over varying distances eg 380m, 540m, 714m, 874m, 1048m. Many stadia offer 6 pack deals for £10 - £15 which may include admission and race card, a basket meal, drinks, a jackpot bet and re-admission for one. A most luxurious track with glass fronted grandstand and offering hot and cold meals in a 400 seater restaurant. A great night out including a race card will cost just £6 - concessions. Boasts one of the most scenic dog racing stadia in the UK with its wide sweeping track and excellent amenities. These include a comfortable restaurant with 3 course menu, fast food outlets in the main stand and ample parking. Crayford Greyhound track has been the home of dog racing for over 60 years and despite its age has kept pace with the very best dog tracks in the UK. Situated conveniently near the M25 and Dartford Crossing the racegoer (not to mention the dogs) is pampered with full air conditioning, restaurant, fast food outlets, bars and fine viewing areas. £1.5 million has been spent on this prestigious venue which has everything from Executive suites, four bars, a restaurant and snack bar, Totalisator with TV screens. Not forgetting disabled facilities and secure parking to ensure a memorable and relaxed night out. A fine greyhound racing stadium seating 1,370 with parking for 400 cars. Facilities include 170 seater restaurant, fast food bars, Tote service with cctv, disabled facilities and baby change room. Business facilities are second to known with the William Hill Banqueting Suite seating 200 and the Pedigree Suite, 100. There is a restaurant serving 3 course meals from £12 - £22.50 and snacks are available in both upstairs and downstairs bars. 6 packs are available on request. Nottingham Greyhound Stadium is well situated to allow easy access from the East Midlands and specializes in affordable corporate hospitality. The Classics restaurant seats 350 and offers a table service for food, drinks and Tote betting. There are also 3 bars and a fast food outlet. There has been greyhound racing at this family owned track since 1965 with its easy access from Durham and Newcastle and has parking for 160 cars. The superb Panorama Restaurant serves fresh affordable food and special packages are available on request. Race days are Friday, Saturday and Sunday and admission is £6 for adults, £2.50 for children over 5 yrs old and OAPS's free. A good sized greyhound racing track with seating for 1500 and parking for 400 cars. Book for a meal in the restaurant or bag a function room for a party. This prestigious track offers the best in comfort and amenities combined with a friendly and relaxed atmosphere. The air-conditioned grandstand also boasts two private corporate boxes for up to 40 guests. The Raceview Restaurant offers a 3 course menu with tote betting direct from your table and there are a number of bars and fast food outlets. A nice stadium in town capable of seating 2,500 with parking for 500 cars. Facilities available include function rooms, restaurant carvery and fast food outlets. totalisator with photo finish and video race replay. Helpful race cards, commentary and assistance for the disabled ensure everyone has a great time. With four bars available one is spoiled for choice at Shawfield, all of them available to hire fore private functions. There is also a restaurant to seat 70. Racing is on Friday and Saturday evenings with admission £6. The Owlerton stadium is renowned for its fine track and lively and friendly atmosphere. The restaurant and bars are maintained to a high standard and available to hire for functions up to 300 people. Greyhound racing takes place at Central Park Stadium, completed in 1995. This £6m complex provides luxurious restaurant, bars, stage and dance floor. Racing takes place on Thursday, Friday, Saturday and Sunday. Admission from $4.50 - £6.50 incl race card and accompanied children £3. This is the largest stadium in the North East and is able to accommodate a wide range of functions in executive suites, restaurant with table service and tote betting, bars and function suites. Six packs available for £10 pp. The greyhound racing track at Swindon has a good restaurant with a bar catering for 60 for private functions and 2 snack bars. This fine and luxurious racing track in South London has a Grandstand Restaurant serving 3 course meals which include table service with tote betting. There are also trackside food bars and tote betting. Six packs are available on request. Race days are Friday and Saturday with admission £6 for adults and £3 for 12 - 17 year olds while under 11's get in free. Telephone Enquiries: Reception – 0208 946 8000 . 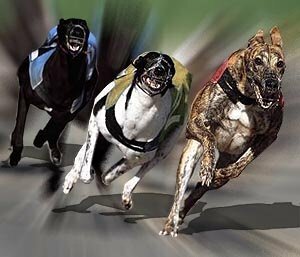 A great night out greyhound racing for holidaymakers at one of Britain's top seaside resorts. Extensive facilities include 3 raceview bars, a raceview diner serving top bar food and on the ground floor amusement areas and a snack bar. State of the art betting facilities which include horse racing are also available.